Over the past several months I wrote posts about each of the 5 senses of the parakeets. 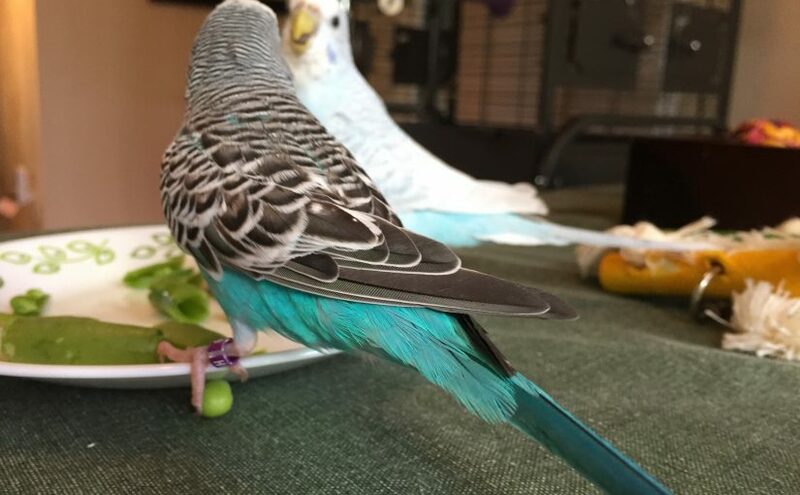 I think it’s good to have some basic knowledge about how your parakeet perceives the world so you can accommodate his needs and understand things that might be scary, or conversely, might be very pleasing to them. Here are links to all of those posts with some key facts for each sense. Parakeets have much better vision than humans and can see ultraviolet light. With the exception of a few color mutations – parakeets eyes change as they age, they develop a visible iris and begin to “flash” or “pin” their pupils in response to stimuli. As good as parakeet sight is during the day it is terrible at night, which can be the root cause of night terrors. Any movement detected during the night can be perceived as a threat. Parakeets have an internal ear, an adult parakeet’s ear holes are not typically visible unless the parakeet is very wet. They also have perfect pitch and can store sound in their memories with incredible skill. Parakeets that live together will “flock call” to each other frequently when they are out of eye line to check in and make sure everything is okay. Some parakeets also loudly call out to birds that they hear outdoors, this is cute, but can be quite loud and go on for hours. Don’t expect to pet or snuggle your parakeet. Although some may learn to enjoy it, petting is not a natural behavior to a budgie. Parakeets are very sensitive to vibrations – cars and trucks lumbering by may vibrate the budgies cage and can be a little scary. It’s also best to keep cages away from appliances that vibrate, such as refrigerators and washing machines. Our parakeets are able to feel pain, so we have a great responsibility to make a safe environment for our pets. Of course this applies to every pet in your home! Scientists aren’t quite sure how much parakeets use their sense of smell. In the wild it is probably not a key part of how they evade predators they way that sight and hearing are. They do not use their sense of smell to know who you are – since their sights and hearing are so much better they recognize the way you look and the sound of your voice. Possible lack of importance of the sense has nothing to do with chemical and smoke sensitivity – Teflon, burning candles, chemical cleaners etc. are all very dangerous. Parakeets have fewer taste buds than humans and the taste buds they do have are located at the base of the tongue. As foragers, keen sense of taste wouldn’t be a huge benefit. If you need to scrounge around on the ground for your food it wouldn’t do to be picky!! They can detect the taste of sweet foods which is probably why many parakeets prefer fruit to vegetables – but watch out for overdoing the sugar. Please click the link on the individual senses for more detailed information about each – there are a ton of useful tips and points to ponder for each sense. I spent a single blog post on both sense of sight and sense of hearing, but smell and taste are going to end up lumped in together! This is largely because they are less essential to the parakeet and probably impact his behavior less in your home. As far as smell goes, all the scientists appear to agree that parakeets have the ability to smell; but they don’t really agree on how good the sense is or how much they use it to function. Some say it’s almost as good as humans and they use it for foraging and to find their way home in the wild. Others say it’s quite limited, or possibly they just don’t use it that much. Either way, they probably rely much more on their sense of sight to locate food and their sense of sight and hearing combined to evade predators. Sense of taste is less developed in parakeets than it in in humans. They have fewer taste buds and those taste buds are located at the base of their tongue. They can probably detect sweet and sour. They can also tolerate spicy peppers because their receptors for spice don’t react the way ours do. 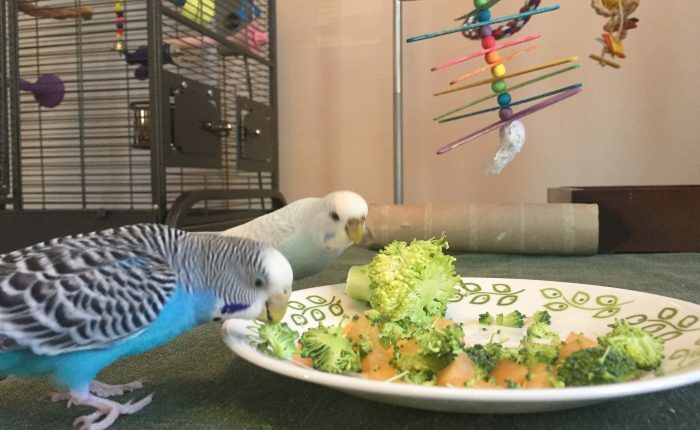 Individual parakeets have different preferences for foods based on taste. Some parakeets can have quite a sweet tooth for fruits, but due to sugar content these should be treats only and not fed on a daily basis. In our house, Toby likes vegetables and shies away from the sweeter stuff, while Kelly is equal opportunity but really loves peaches and strawberry. So – why would these senses be so much less developed than sight and hearing? Well, it really wouldn’t suit a forager to be too concerned with how good their food tasted or smelled, since they basically have to live on whatever they can scrounge up. They can tell by sight if a fruit or vegetable is spoiled, so no sense of taste needed there. Also a sense of taste would certainly be no use in getting away from a predator, although I could see how a sense of smell might be a good alert system, having an incredible panoramic view and a keen sense of hearing are probably good enough. This does mean that you can’t use the smell of a certain food to entice your budgies into trying something new, but you can show them it’s good to eat by eating it yourself. You can also get them excited by making noises associated with food preparation. Mine just have to hear their dish come out of the cabinet and they immediately start watching me closely. A note – the sense of smell being poor doesn’t mean they are less sensitive to fragrances and chemical odors. On the contrary things such as candles and Teflon are toxic to birds and kill them by destroying their lungs. It does, however, mean that your parakeet won’t be put off if you want to hang out with him after coming home from the gym a bit ripe – so that’s a bonus!